For other uses, see Dysnomia (disambiguation). Dysnomia (Greek: Δυσνομία)—officially (136199) Eris I Dysnomia—is the only known moon of the dwarf planet Eris (the most massive known dwarf planet in the Solar System). It was discovered in 2005 by Mike Brown and the laser guide star adaptive optics team at the W. M. Keck Observatory, and carried the provisional designation of S/2005 (2003 UB313) 1 until officially named Dysnomia (from the Ancient Greek word Δυσνομία meaning anarchy/lawlessness) after the daughter of the Greek goddess Eris. 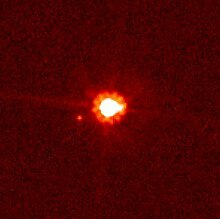 During 2005, the adaptive optics team at the Keck telescopes in Hawaii carried out observations of the four brightest Kuiper belt objects (Pluto, Makemake, Haumea, and Eris), using the newly commissioned laser guide star adaptive optics system. Observations taken on September 10, 2005, revealed a moon in orbit around Eris, provisionally designated S/2005 (2003 UB313) 1. In keeping with the Xena nickname that was already in use for Eris, the moon was nicknamed "Gabrielle" by its discoverers, after Xena's sidekick. −0.01. The estimate was obtained using radiometric observation by ALMA observatory in submillimeter spectral region. In its discovery images Dysnomia was ~60 times fainter (or 4.43 magnitudes) than Eris in the K band, and later observations with the Hubble Space Telescope found it to be 500 times fainter in the visible band. This indicates a very different, and quite redder, spectrum, indicating a significantly darker surface. Its diameter reveals it to be a rather large Trans-Neptunian object. Of the known moons of dwarf and minor planets, only Charon is larger than Dysnomia. Combining Keck and Hubble observations, the satellite was used to determine the mass of Eris, and orbital parameters were estimated. Its orbital period is calculated to be 7001157740000000000♠15.774±0.002 d. These observations indicate that Dysnomia has a circular orbit around Eris, with a radius of 7007373500000000000♠37350±140 km. This shows that the mass of Eris is 1.27 times that of Pluto. Astronomers now know that the six brightest Kuiper belt objects (KBOs) have satellites. Among the fainter members of the belt only about 10% are known to have satellites. This is thought to imply that collisions between large KBOs have been frequent in the past. Impacts between bodies of the order of 7006100000000000000♠1000 km across would throw off large amounts of material that would coalesce into a moon. A similar mechanism is thought to have led to the formation of the Moon when Earth was struck by a giant impactor early in the history of the Solar System. Mike Brown, the moon's discoverer, chose the name Dysnomia (Greek: Δυσνομία) due to a number of associations it had for him. Dysnomia, the daughter of Eris, fits the general historically established pattern of naming moons after lesser gods associated with the primary god (hence, Jupiter's largest moons are named after lovers of Jupiter, both male and female, while Saturn's are named after his fellow Titans). Also, the English translation of "Dysnomia", "lawlessness", echoes Lucy Lawless, the actress famous for starring in Xena: Warrior Princess on television. Before receiving their official names, Eris and Dysnomia were nicknamed "Xena" and "Gabrielle", and Brown decided to retain that connection. Brown also notes that Pluto owes its name in part to its first two letters, which form the initials of Percival Lowell, the founder of the observatory where its discoverer, Clyde Tombaugh, was working, and the person who inspired the search for "Planet X". James Christy, who discovered Charon, followed the principle established with Pluto by choosing a name which shared its first four letters with his wife's name, Charlene. "Dysnomia", similarly, has the same first letter as Brown's wife, Diane, and Brown uses the nickname "Dy" /ˈdaɪ/ for the moon, which he pronounces the same as his wife's nickname, Di. Because of this, Brown pronounces the full name /daɪsˈnoʊmiə/, with a long "y". ^ dis-NOH-mee-ə or dys-NOH-mee-ə. The former is the normal mythological pronunciation, the latter is used by Brown. ^ The orbital period (P) is 15.774 d. The orbital circumference (C) is 2π*semi-major axis. Dividing these (P/C) using the correct units gives 0.172 km/s. ^ a b Dysnomia's brightness is 1/500 of Eris in the visible band. With H = −1.19 for Eris, this gives H ≈ 5.6 for Dysnomia. ^ a b Brown, M. E.; et al. (2006). "Satellites of the Largest Kuiper Belt Objects" (PDF). Astrophysical Journal Letters. 639 (1): L43. arXiv:astro-ph/0510029. Bibcode:2006ApJ...639L..43B. doi:10.1086/501524. Retrieved 2011-10-19. ^ Brown, M. E.; Schaller, E. L. (2007). "Supporting Online Material for The Mass of Dwarf Planet Eris" (PDF). Retrieved 2 February 2019. ^ a b c d Brown, M. E.; Schaller, E. L. (2007). "The Mass of Dwarf Planet Eris". Science. 316 (5831): 1585. Bibcode:2007Sci...316.1585B. doi:10.1126/science.1139415. PMID 17569855. ^ a b c d Brown, Michael E.; Butler, Bryan J. (2018). "Medium-sized satellites of large Kuiper belt objects". arXiv:1801.07221. ^ a b Brown, M. E. (14 June 2007). "Dysnomia, the moon of Eris". Caltech. Retrieved 2011-07-03. ^ Green, D. W. E. (13 September 2006). "(134340) Pluto, (136199) Eris, and (136199) Eris I (Dysnomia)". IAU Circular. 8747. Retrieved 12 January 2012. ^ Zabarenko, D. (3 October 2005). "Planet Xena has moon called Gabrielle". Australian Broadcasting Corporation. Retrieved 9 March 2008. ^ Ingham, R. (2 February 2006). "'Tenth planet' Xena bigger than Pluto". Australian Broadcasting Corporation. Retrieved 9 March 2008. ^ Johnston, W. R. (30 December 2008). "(136199) Eris and Dysnomia". Johnston's Archive. Retrieved 2012-04-12. ^ Green, D. W. E. (4 October 2005). "S/2005 (2003 UB313) 1". IAU Circular. 8610. Retrieved 12 January 2012. ^ Sicardy, B.; et al. (2011). "A Pluto-like radius and a high albedo for the dwarf planet Eris from an occultation" (PDF). Nature. 478 (7370): 493–496. Bibcode:2011Natur.478..493S. doi:10.1038/nature10550. PMID 22031441. ^ Santos-Sanz, P.; et al. (2012). 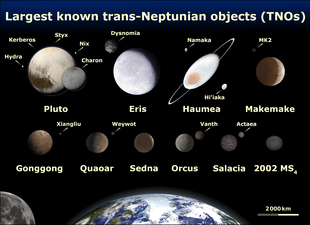 ""TNOs are Cool": A Survey of the Transneptunian Region IV. Size/albedo characterization of 15 scattered disk and detached objects observed with Herschel Space Observatory-PACS". Astronomy & Astrophysics. 541: A92. arXiv:1202.1481. Bibcode:2012A&A...541A..92S. doi:10.1051/0004-6361/201118541. ^ Tytell, D. (14 September 2006). "All Hail Eris and Dysnomia". Sky & Telescope. Retrieved 30 December 2006. ^ "Julia Sweeney and Michael E. Brown". Hammer Conversations: KCET podcast. 2007. 42 min 12 sec. Archived from the original on 26 June 2008. Retrieved 28 June 2008.